Eczema is an inflammatory skin condition that affects many adults and children. 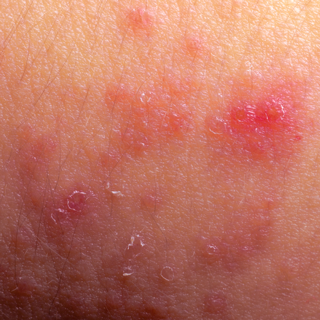 It presents as itchy, dry, and rash-like patches on the skin. Eczema can at times be a persistent and difficult condition to get under control. Chinese Medicine often views eczema as associated with “dampness”. “Dampness” in Chinese Medicine terms refers to the body not being able to move fluids properly. When you think of dampness you think of excess moisture that is stuck and sticky such as humidity. This also describes how the body is if there is “dampness” — stuck and sticky. Dampness can result from a poor diet eating foods that are too raw, cold, sweet, or damp forming foods (which include fatty, fried, or overtly spicy foods), living in damp environments, or from over-medication. Dampness can be seen in the body as fluid deposits (edema), cysts or overgrowth of yeasts, bacteria, or parasites. Some conditions in addition to eczema associated with dampness include: blisters, water retention, diarrhea, productive coughs, edema, and arthritis especially osteoarthritis. Acupuncture can be used to help treat eczema, along with making dietary modifications. Certain acupuncture points target clearing dampness as well as helping the spleen do its job more efficiently. Eating foods that can resolve dampness include such things as corn, barley, rice, mushrooms, celery, lettuce, pumpkin, lentils, garlic, horseradish, lettuce, mustard greens, cucumber, mushrooms, daikon radish, onion and beverages such as green, raspberry, chamomile and jasmine teas. Helpful spices include turmeric, basil, bay leaf, cardamom, cumin, and fennel. Foods to avoid include dairy products, concentrated fruit juices, bananas, deep fried and fatty foods, and refined wheat products. If you suspect you or a loved one has eczema and treatments you have sought to date have now proven helpful, you may consider giving Chinese Medicine a chance to see if it can make a difference in your condition.